WARPAINT and Unicorns: IMATS TORONTO 2013 travel advisory & eateries. 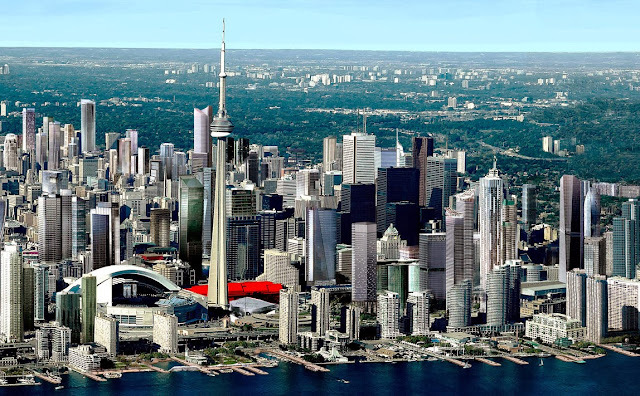 If you not a native to the GTA (Greater Toronto area) I thought I'd post this for you about what to expect getting the the MTCC (Metro Toronto Convention Centre) South Building this year. The North and South buildings are attached by a walk bridge. The North building is street level on Front Street west of the CN Tower and goes vertically in levels and well as 2 subfloors, while the South building is behind it and is underground for the most part except the lobby level (500 Level). If you coning in by public transit chances are you will be making it to Union Station. Union Station however is going through some serious renovation both street level and inside. Front Street is shut down in front of Union Station (for the drivers), but the building is still functional. For pedestrians/public transit goers inside Union on the street level is attached to the Skywalk which will take you to both the MTCC North and South builds and beyond (Skydome). This is probably you best way to get there to avoid confusion and it tends to be quite. You can also walk Front St. east of Union and get to the North building. Here is a posting about road construction areas for drivers to be aware of per week if you coming into the down town core. Now place to eat there are plenty of options around the MTCC as this is consider to the Entertainment district. Front street has many options on the main level but there are places underground like across the MTCC is the Canadian Broadcasting Building subfloor has a full food court. Union Stations also as a full food court on the level below street level for cheaper fare.